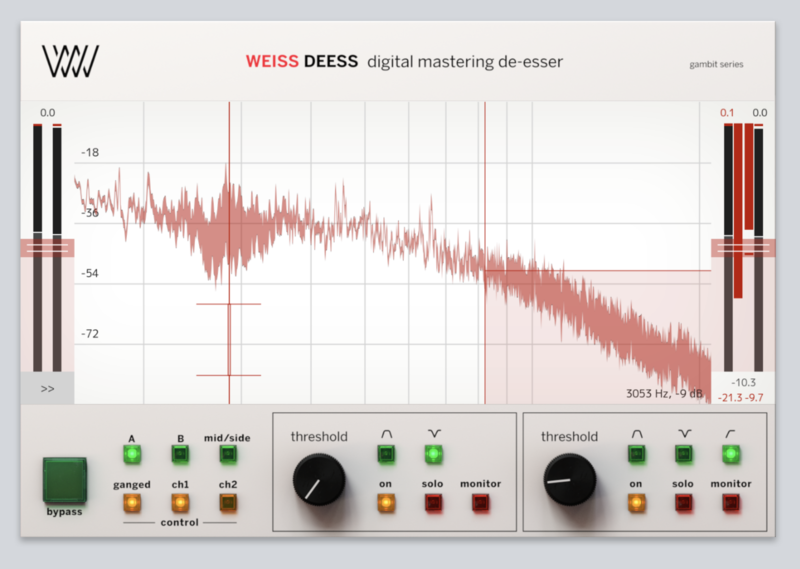 A good, easy-to-use De-essing plugin can be hard to come by. Softube has released their version with the Weiss Deess. Whether you’re trying to tame sibilance in a lead vocal, rein in a sharp-sounding hi-hat, or reduce harshness while mastering, a truly great de-esser is as elusive as it is essential. Now, with a combination of the highly-prized sonics of the Weiss DS1-MK3 – the go-to digital hardware de-essing unit used in top mastering studios the world over – and a totally modern and focused approach in design, Softube is psyched to announce the Weiss Deess Plug-in. Stop searching, start succeeding – this is the de-esser. It has two completely independent bands. Most de-essers have one. It has a variety of filter shapes and excellent band-width control, allowing you to home in on precisely what you need to deal with, without collateral damage. It has unparalleled visualizations. A large, colorful, and intuitive display shows FFT readouts as well as your filter shapes, so you can clearly see what effect you’re having on your signal. The faceplate GUI is uncluttered, focusing on giving great visual information, but a side-menu allows control over everything. And we mean everything; ratios, attack and release times, knee settings, make-up gain and more. A low-latency mode allows you to de-ess in tracking, saving the tedium in the mix of what can often feel like a non-creative editing task. Nothing beats getting it right on the way in. Lastly, and most importantly of all, the Weiss algorithms, code-ported from the gold-standard DS1-MK3 unit, provide the best sounding de-essing in the world. Your work will sound better if you use this than it will if you don’t. It’s as simple as that. Visit the Weiss Deess product page to find out more.